This was a little conversation between me and Barry a short while back – and he asked a good question. 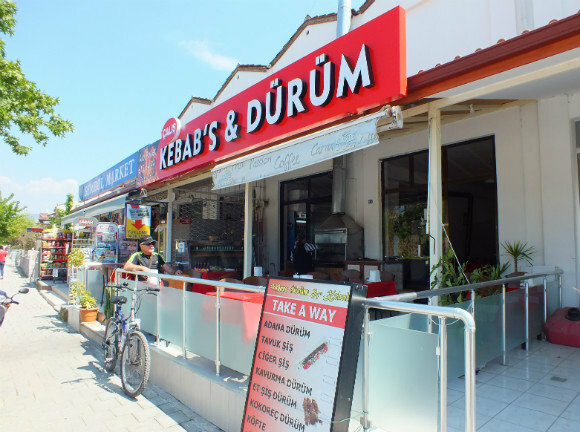 Why have we never written about the kebab place in Çalış? Maybe it’s because it’s somewhere we go to grab something for a quick lunch? I take my camera everywhere with me but maybe it’s just never felt like a camera-photo-taking-place. Really no definite answer to that one. Anyway, this post is putting that right, because it’s most definitely not a place that doesn’t deserve to be on our blog. It’s very reasonably priced and the kebabs are fabulously tasty and filling. And there’s something a little bit different about Çalış Kebabs & Dürüm. 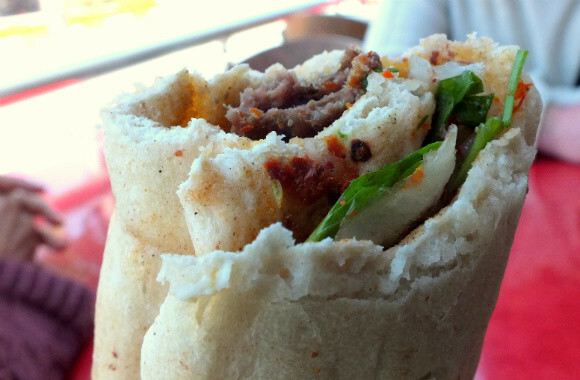 Usually, the role of kebapçı (he who makes kebabs) is the domain of the male of the species. It’s just the way it is. But here, at Çalış Kebabs & Dürüm, your kebab is generally cooked by a lady – and a very friendly, smiley one, at that. We order the same every time we go. I get Adana (spiced minced lamb) dürüm and Barry gets ciğer (liver) dürüm. If Barry’s mum comes with us, too, she’ll go for tavuk (chicken) dürüm. The first time we took Barry’s mum, we were a bit nervous. We come here for a quick, simple lunch. Barry’s mum doesn’t like red meat and if she comes across any fattiness in her white meat, that’s it – she can’t eat that either. But the chicken şiş kebab at Çalış Kebabs & Dürüm has been put through the Barry’s-mum-test and enjoyed – and it’s been enjoyed on more than one occasion, now. All the skewered meat is kept in a display fridge at the side of the terrace and we sit at one of only a few tiny tables that take up the rest of the space. Against the wall is a charcoal grill sat atop a small sideboard; the type of sideboard that would be more suited to the inside of a house than a kebab eatery – but they serve a good purpose. In the drawers are neat piles of bakery-fresh lavash bread. We order our kebabs – and abla (our lady kebapçı) stokes the coals before going to the fridge for a skewer of Adana and one of liver. They’re placed on the grill and one length of lavaş is removed from the drawer. It’s rounded ends are removed and then it’s cut in half (one lavaş is long enough to make two dürüm kebabs) before being placed on the far side of the grill. It’s a bit cooler there but the bread still heats through and sometimes even gets little bonus charred bits, too. 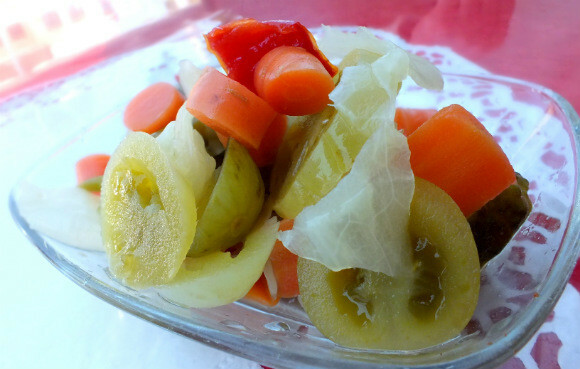 While the meat is grilling over the coals, she brings turşu (Turkish pickled vegetables) to the table. No dürüm is complete without turşu. We guess they’re homemade because the contents of the bowl are different each time we visit, and the flavour different, too. The ones in this photo had clearly been sat in the company of chillies for some time. Super-feisty – but we love them like that and the bowl is almost empty before the kebabs are ready! Drinks? Ayran for us, please. The kebabs are turned over and the lavaş bread is lightly pressed onto the cooked side so that the meat juices soak into the bread. The lavaş is replaced at the side of the grill and then abla goes to her chopping board which also sits atop the sideboard, next to the barbecue grill. Within seconds, her huge blade has produced a series of thinly sliced onion half moons. Parsley, lettuce and tomato is chopped, too, and the salad – just enough for two kebabs – is tossed together. We don’t know why she does it like this (for freshness?) but she only chops enough salad for each dürüm. And it’s not that Çalış Kebabs & Dürüm isn’t busy enough to prep a big batch of salad beforehand. There’s a constant stream of workmen and takeaway orders so the charcoal grill is almost like a conveyor belt…but the salad is still chopped for each order. It’s a lovely thing to watch. After just a few minutes, the lavaş is removed from the grill and placed flat onto the surface. A skewer is taken from the grill, placed onto the lavaş lengthways and the bread is folded over it and pressed down. Abla slides the skewer out, leaving a neat row of meat along the bread. The salad is arranged over the top. For other ideas of where to eat and drink in the Fethiye area – ideas to suit all budgets – visit our Fethiye Restaurants & Bars page. Nice piece – really lovely right up. The simple things in life, eh? Can you tell me if this place stays open into the evening for a light dinner? – Sunday morning brain freeze!